Turkey Tracks: Vicki Fletcher’s Mt. Battie Modern Traveling Quilt is Done! Vicki Fletcher’s Mt. Battie Modern Traveling Quilt is Done! Wow! 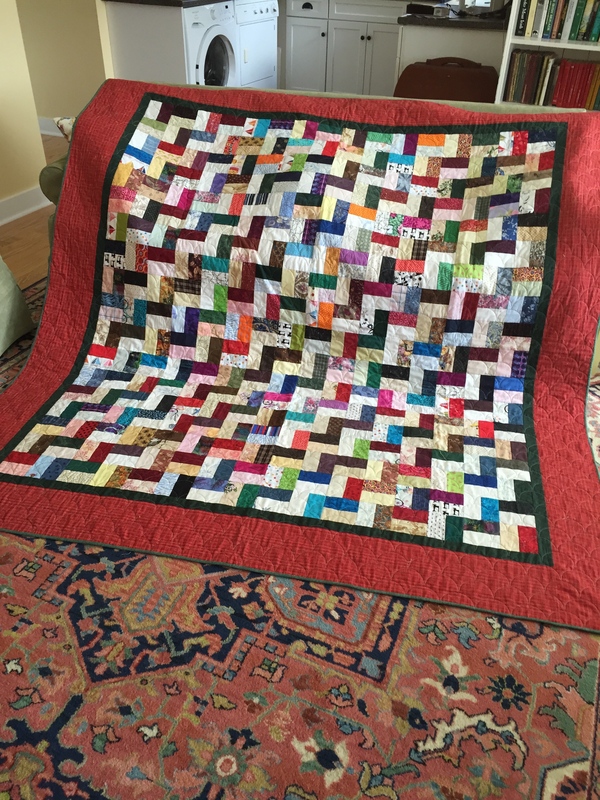 Vicki’s Traveling Quilt—a project last year for the Mt. 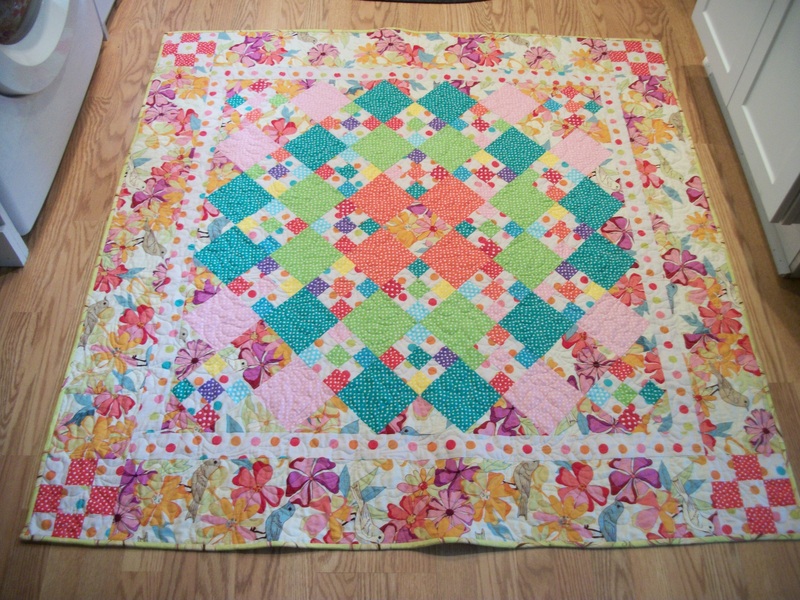 Battie Modern Quilit Guild—came out so pretty! It’s the FIRST of these quilts to be finished. To remind, those of us who took on this challenge started with one block. We each made a little book or set of instructions telling everyone what we liked and disliked. Then, as each of us got the developing quilt, we added to it, using the original information and what other people had done. 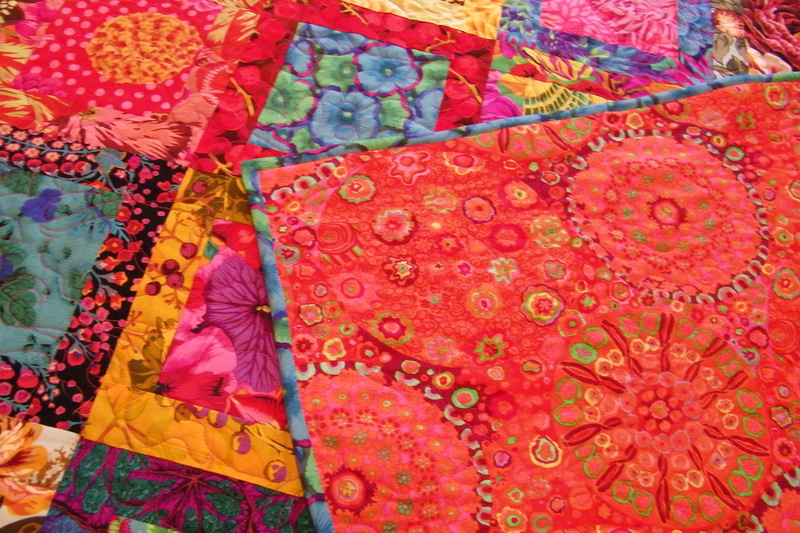 Gradually, the quilts began to come together along their journey. There were eight of us, and the project took about 18 months. Stacy Hallowell at Mainely Sewing, owned by Marge Hallowello, quilted the quilt. I really like the choice of the Bishop’s Fan for this veryl modern quilt. The backing choice is awesome! And the royal blue binding is just perfect. 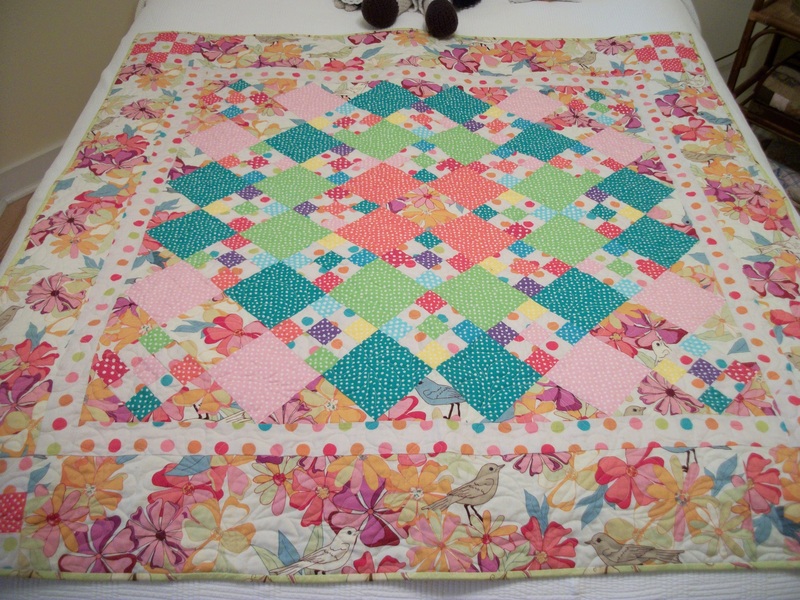 Vicki also just finished this quilt for a family member. We held it sideways so it would not get dirty. Stacyl quilted this one, too. Love the circles! And look at this great backing! It’s perfect for this quilt. 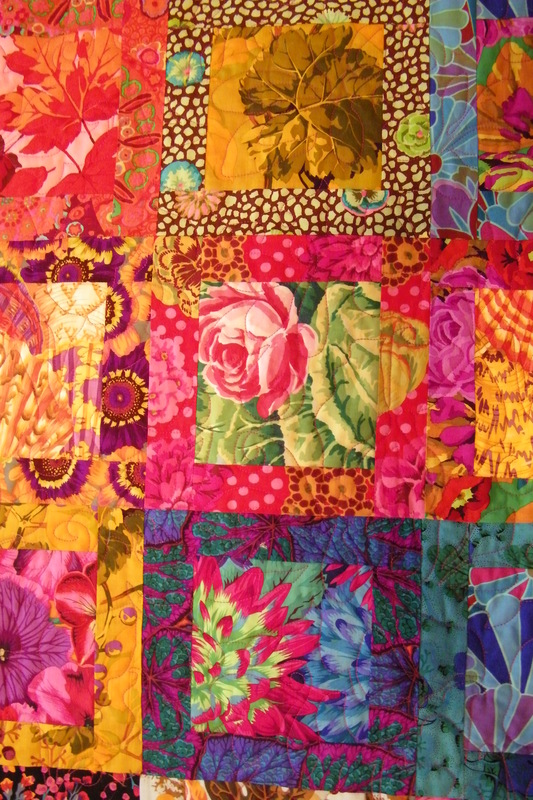 Here is Jan Kelsey’s “post card” quilt, which she has worked on in previous retreats. The post cards were written by her grandparents and handed down to her. 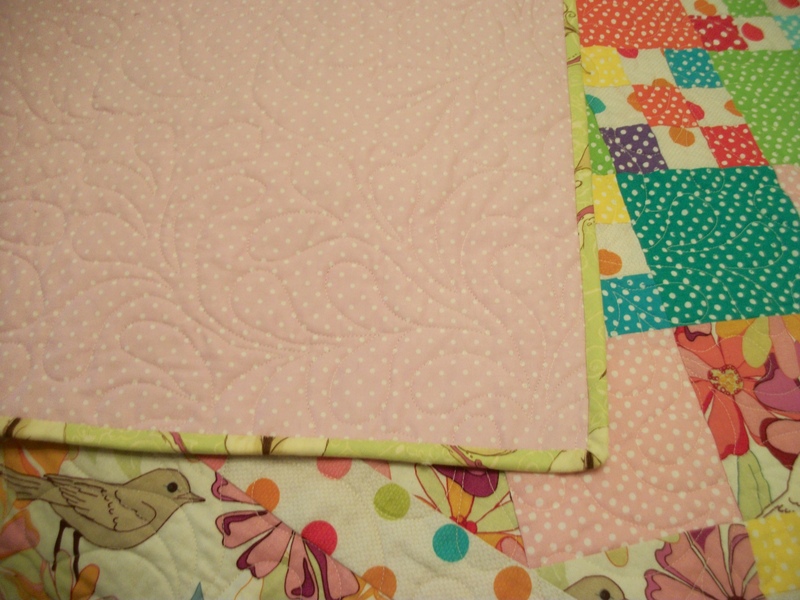 The quilting came out really pretty. 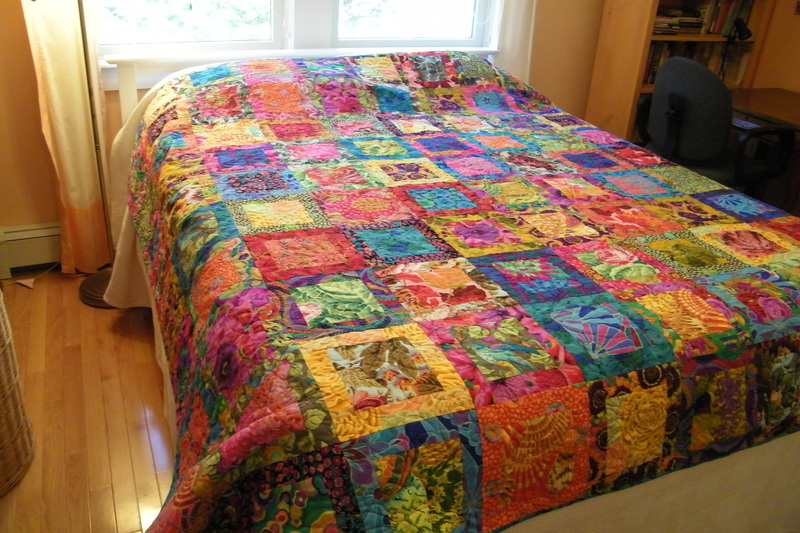 Stacy at Marge Hallowell’s Mainely Sewing, in Nobleboro, Maine, did the long arm quilting. Jan pulled out this quilt last minute as I was leaving. I absolutely love it. I love blue and neutral quilts anyway, but a house quilt…oh my. I love the half-square triangle corner stones too. They give the quilt a lot of movement I think. Mac (Nancy) Saulnier and Jan Kelsey went to college together and have remained friends since. Mac comes to us from Massachusetts for our retreat. She worked on a “trip” quilt made with bigger squares. Her husband picked out these colors. She got all the big sections done on this retreat. This retreat was Jane Liebler’s first. She is discovering that she is an “improv” quilter. Look what she did in the space and time of our retreat. Go Jane. Last Tuesday was “play day”–with Megan Bruns, who had a day off before starting a new job. We headed south to Alewives Quilting (Damariscotta Mills) to see the new Cotton + Steel white collection and Megan was looking for fabric for pillows. Here’s the collection minus the typewriter fabric, which already sold out. 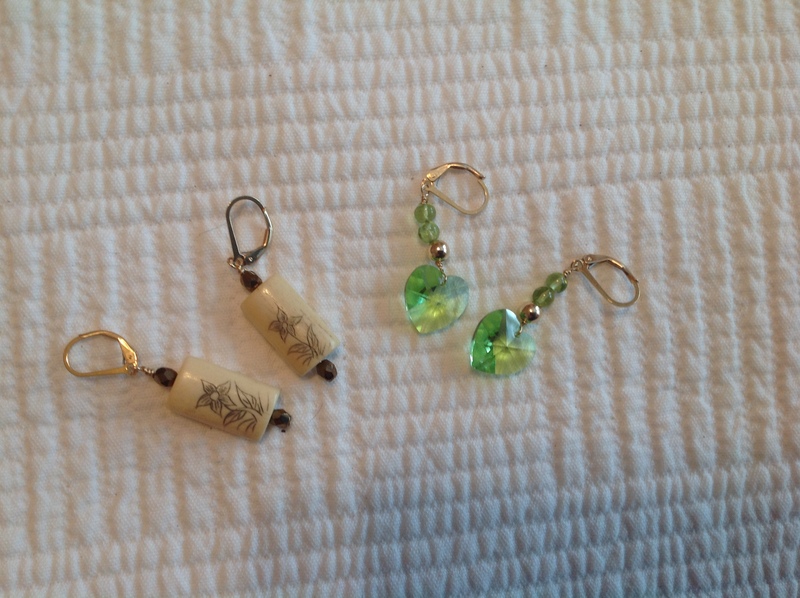 It’s so fun to make earrings! Lunch was at the River Grill in Damariscotta–they make the best mussels in the whole world. Coffee for the road at the little bookstore across from the River Grill. And a stop by Mainely Sewing to visit with Marge Hallowell on the way home. It was a FUN play day! 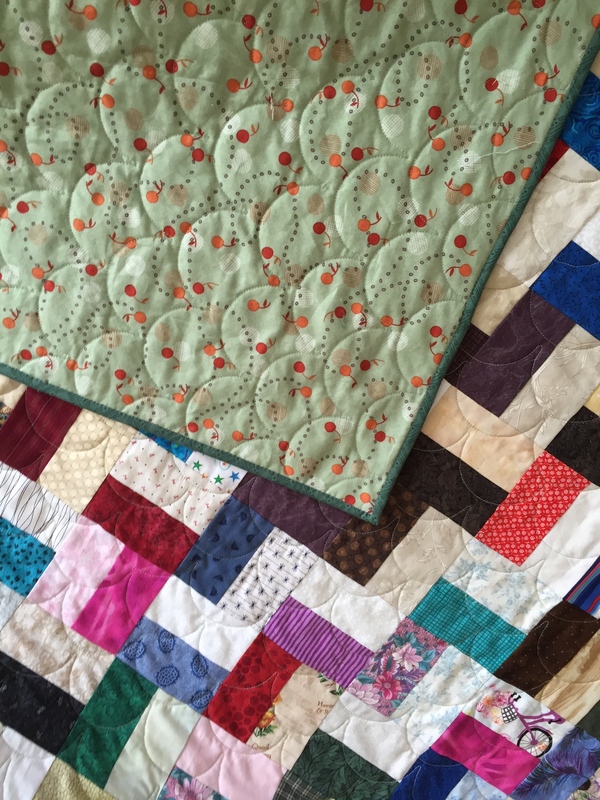 It occurs to me that I never put finished pics of this quilt up on the blog–though I finished it back in the winter–and am enjoying using it so much. The red border fabric is from a piece I’ve had for over 12 or more years. 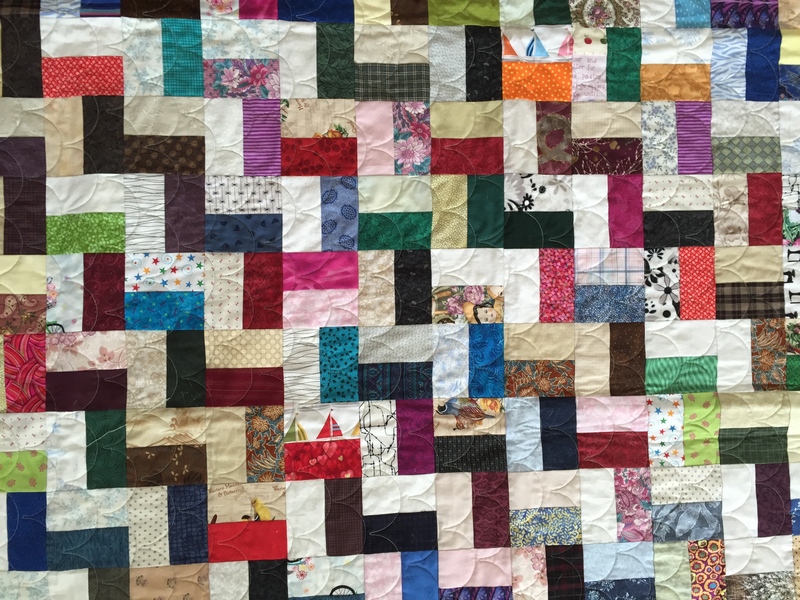 Ideas about quilts change over the years, and I no longer wanted to make the quilt for which this fabric had been purchased. So… It’s brilliant in this quilt. Quilts like these three quilts all made from my 2 1/2-inch fabric strips remind me over and over of other quilts I have made. Invariably, seeing a fabric from another quilt makes me smile. This quilt is No 113 and was finished probably in February. 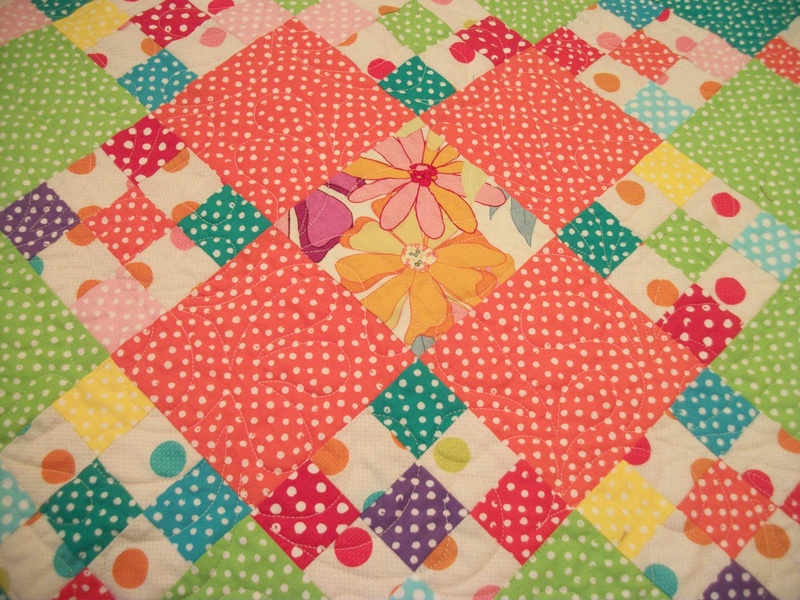 A baby quilt for a little girl! Here’s the fabric with which I started. I fell in love with the large print last fall at Marge Hallowell’s Maine-ly sewing in Nobleboro, Maine, and knew I’d use it in a baby quilt. 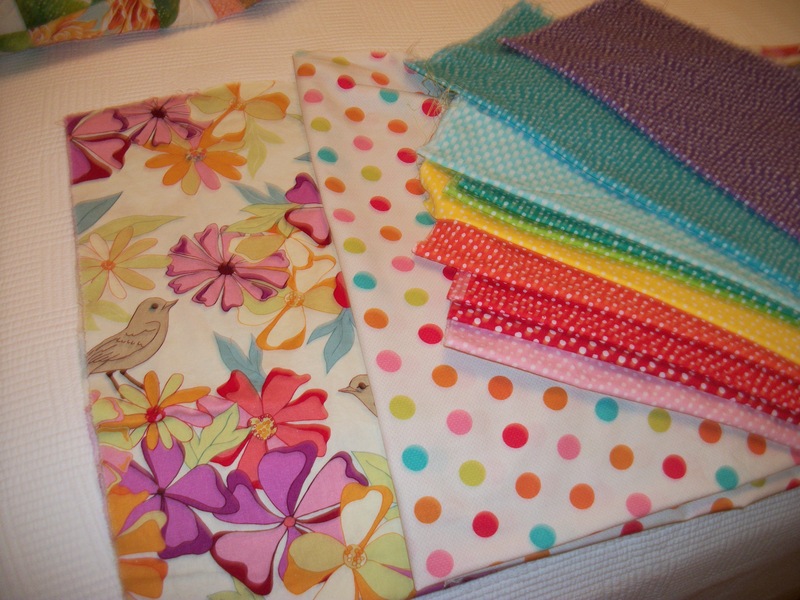 Then, while at Maine-ly Sewing, at a January sale day, I saw these polka dot fabrics. Of course they were NOT on sale! As the large print was still in the store, I was able to determine that the polka dots would work. Friend Gail Nicholson saw the BIG polka dots and said she was sure they would work really well with the little ones. So I bought that fabric too. 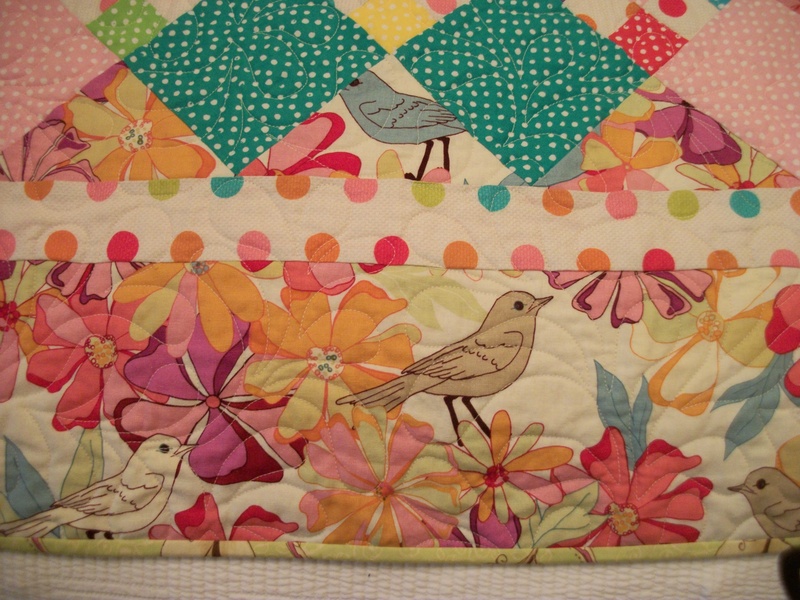 “Songbird” is a nice size, too–which you can tell when it’s on a queen-sized bed. I like the low-contrast of many of the nine-patch blocks in this quilt as they allow the big print and some of the big polka dot fabrics to shine. And the pantograph was Anne Bright’s “12-inch Simple Feathers.” I really like the soft, feminine curves in this pantograph. The quilting came out really nicely in this quilt. I used a soft cream thread. 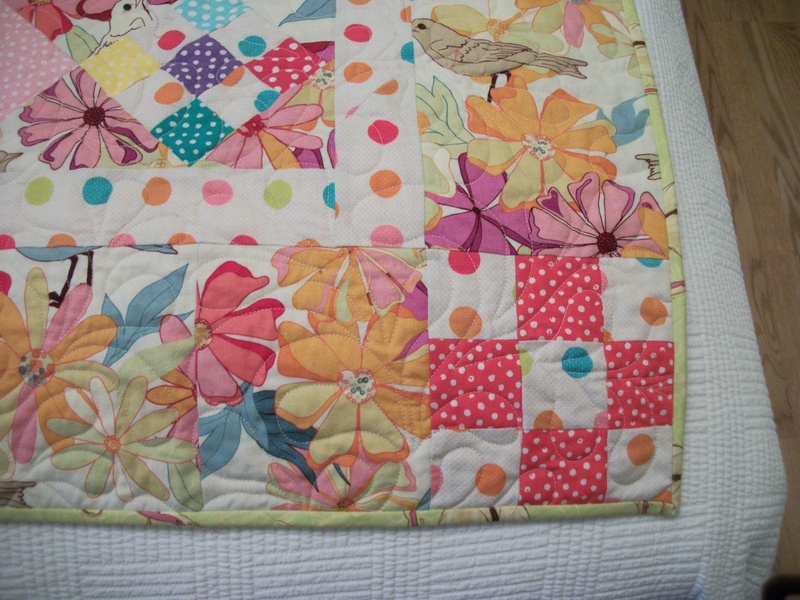 So there you have it: “Songbird” quilt for a little girl, Willamina Grace, who, I hope, will sing through her life. Daughter-in-law Tamara Kelly Enright and I wanted to make bride Ashley Malphrus (now White) a wedding quilt. The wedding was April 21, 2013, and it was gorgeous. The ceremony was held with one of the low country rivers as a backdrop–green lawns, big house, big white tent. It was lovely. Ashley and her mother, Allison Malphrus, had thought of so many thoughtful, sweet touches all during the wedding. I’m always in awe of that kind of thoughtfulness as I’m not good at it. 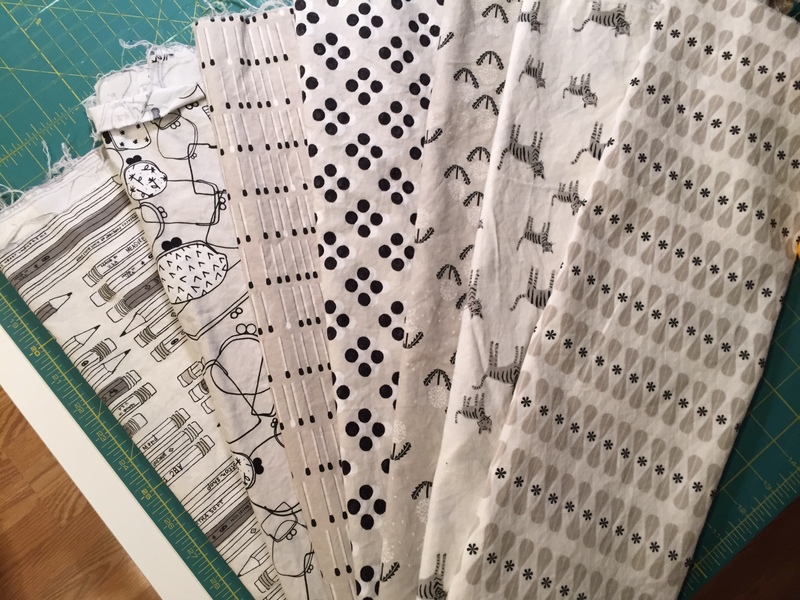 Last Thanksgiving, Tami and I picked out contemporary, colorful Kaffe Fasset fabrics–and Mainely Quilting shopowner Marge Hallowell cut us a big array of the Kaffe Fasset prints. With a “layer cake” design, one starts with a 10-inch square (in our case), cuts off four borders, which leaves a central square. Different borders are put onto different squares, and the result–after using these bright modern prints–is a very contemporary, colorful quilt. 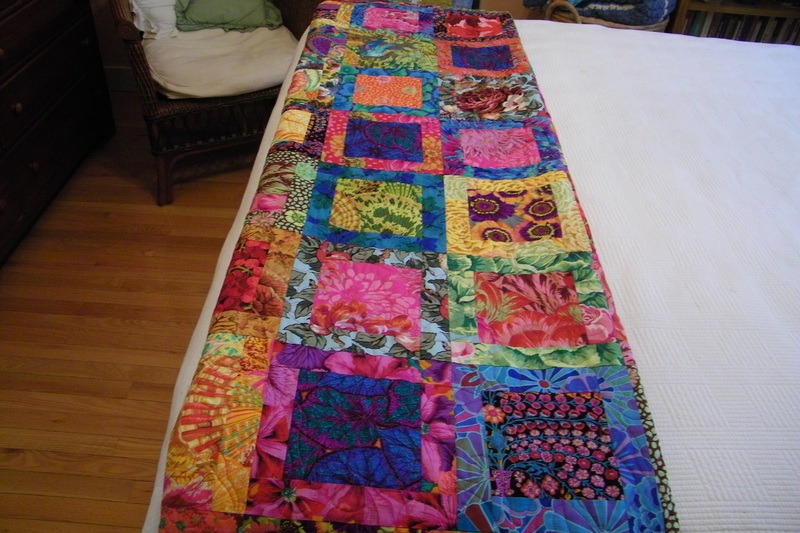 I finished hand sewing the binding just before the wedding and mailed the quilt to Tami. It’s BIG, and I didn’t want to carry it on the plane. Tami and I delivered it the Friday before the wedding, as I didn’t want to have it at the wedding tent. 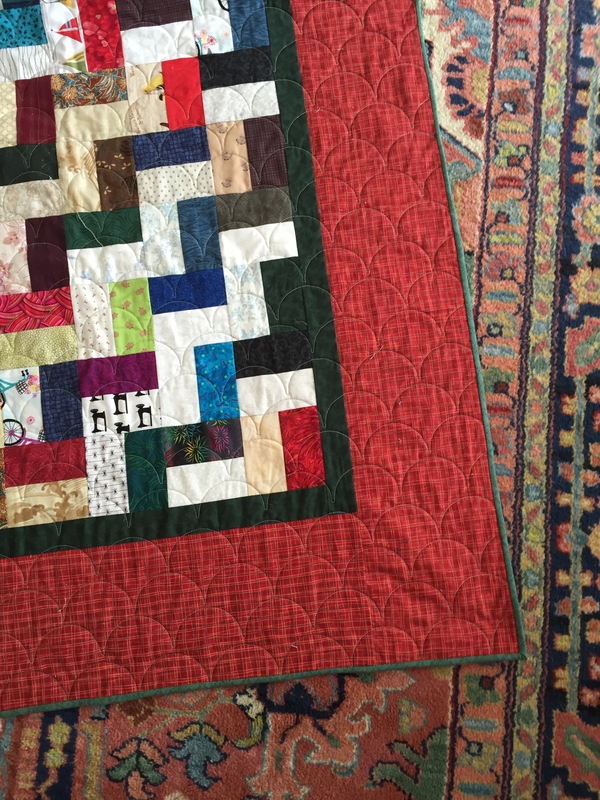 I also wanted to explain that the quilt is an heirloom quilt, to be used and loved, but also to be cherished in the way of being a little careful with it. Here’s “Blossom”–and it’s not a great picture of it. But you can see how big it is. Here’s some blocks close up. 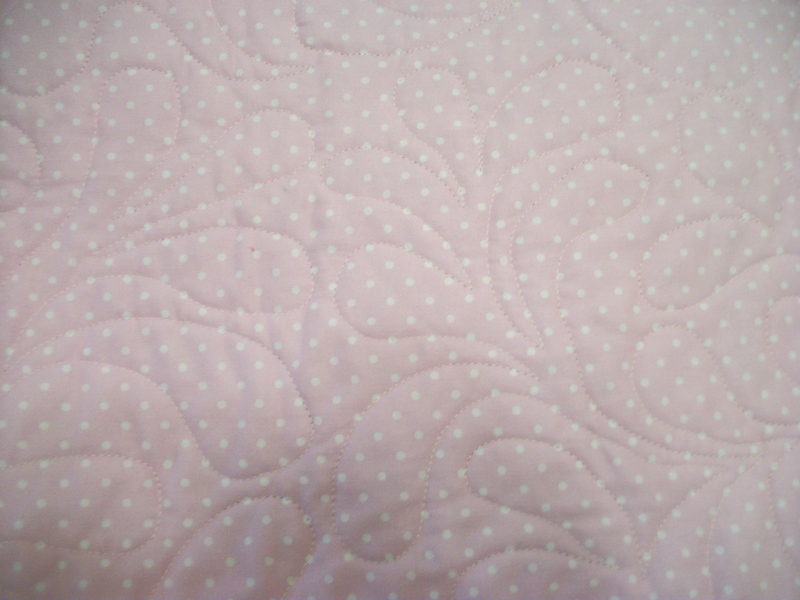 I quilted it with a bright pink thread, and that is wonderful on both the back and the front. I used a “Sweet Pea” pantograph, but both sides are busy enough that you don’t really see the pattern. It will catch Ashley, some day, when the light falls just right on the quilt. I did the best job ever on the quilting.